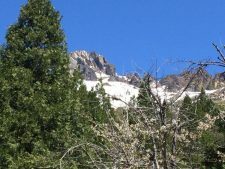 My husband and I have long loved the Downieville and Sierra City areas of the Sierra Nevada for romantic weekend getaways. It’s only about two hours from Sacramento making it a convenient overnighter or weekend destination that doesn’t require half the day on the road. The beautiful scenery, friendly locals, quaint shops and eateries, and outdoor activities have drawn us that direction for decades whether it be to hike, snowmobile, fish, golf, swim, gold pan, tube the river, mountain bike, gather wildflowers, explore waterfalls, or simply to do nothing but soak in the sounds of the raging river, and to savor the magnificent beauty of the wildflowers in the spring. Recently we discovered a new little romantic gem of a cabin resort in Sierra City called Buttes Resort that fits our criteria for the perfect little mountain retreat. It’s perfect for couples to get away alone, and best of all it’s reasonably priced. In fact, under new ownership, this little outdoor mecca is far from new to many returning couples who have enjoyed romantic getaways, family reunions, and making treasured memories there for years. 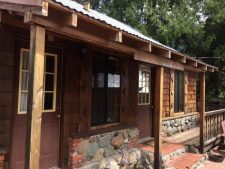 Situated directly above the North Fork of the Yuba River and a stone’s throw from the Pacific Crest Trail, this little oasis is all about peace, tranquility, and enjoying nature. There are only 6 cabins which make it even more charming and peaceful, each with a kitchen, and comfortable, cozy, quality bedding, décor, and toiletries. The gorgeous deck and sound of the rambling river below make for a tranquil setting for barbecues and get-togethers overlooking towering mountains and forests. Innkeeper Jim Westfall is an avid outdoorsman who has a heart for sharing his love with his guests. He’s friendly, helpful, warm, and will bend over backwards to make your clan feel right at home. Last winter a large group was stranded in the snow and he opened his little resort to the temporary refugees and the entire town pitched in to make the group feel welcome and cared for during their stranded adventure. It made the papers how the adorable little town banded together to make the out-of-towners feel right at home during their less than ideal circumstances. Dining options are scarce right in Sierra City with only a couple of tiny eateries with limited and seasonal hours so you’ll do well to bring your food with you to enjoy on the deck of your cabin which comes with a full kitchen and barbecue. Cabins range from $90 to $155 for the Honeymoon Suite and several of the cabins can be connected to accommodate groups, multi generational travelers, or family reunions. If you choose to explore nearby Downieville and Truckee, both have many more dining options and aren’t far away. If you’re looking for low key, outdoorsy activities then this is the place. If you need to be entertained and require a busy nightlife then you may want to choose another option. There is a nice little friendly saloon only a minute walk away, where locals sit and share the news. A fantastic game room with pool and board games is available to guests as well as a vast library of movies to watch. Local massage therapists are available if a relaxing and pampering massage on the deck above the river sounds like just what the doctor ordered. When city life or the strain of the daily grind is getting to be a bit much and you want to simply unwind and decompress and reconnect with nature, The Buttes Resort in Sierra City is just the right place and at just the right price. 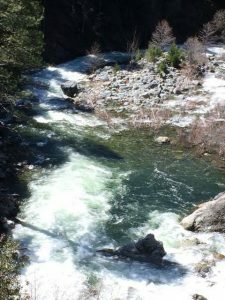 The perfect little all season treasure in the high Sierra is waiting to be discovered.